nikkistyle™: New York Fashion Week (S/S 2015): "I'm just over the hype." Or Am I...? New York Fashion Week (S/S 2015): "I'm just over the hype." Or Am I...? Hey. Hey. Hey. The kick-off of New York Fashion Week is only days away. And the schedule is posted. Yep-that's it. Marissa and Mara. Thinking out loud. 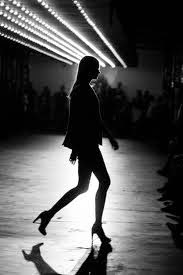 Runway shows are super cool, but I find myself becoming less and less interested in the glitz and overpriced glamour of "fashion week"—and more excited about what goes on behind-the-scenes. Strategic processes is my weakness. I love sitting around a table with highly creative geniuses to make a vision come to life before its debut, the show is merely icing on the cake. And speaking of overpriced glamour, pulling off a spectacular show during "fashion week" is extremely expensive! Why run a deficit year after year to buy $40,000-dollar lighting racks for fall and/or spring shows that run 20-30 minutes behind schedule--with the actual show running for what feels like...eh, 7-10 minutes long? That's a tad bit insane. Though some may beg to differ, and that's totally fine. However, Bob Bland, CEO of Manufacture NY said it best, "You don't have to have a NYFW show every season to have a successful line, and it really is dependent on what your line is about." [Source] That said, there are many talented designers that are not in the mainstream forefront: Sneak a peek at the S/S '15 schedule. Did your favorite designers make the cut? Maybe so, maybe not. And if not, take it with a grain of salt, because they're most likely shining in other ways, at other places. Personally, I prefer intimate fashion presentations that allow its onlookers to study and appreciate the garments—not bolt to the next show. Oh I never really gave it much thoughts to the behind the scenes of Fashion Week, but you are so right! it mas be so cool! Thanks for sharing :) I invite you to visit my blog and let me know if you would like to follow each other to stay in touch. Interesting thoughts. I'm really sorry to say I'm really not in tune of the ins and outs of showing vs. not showing but now I'm intrigued to read about more of the brands that don't. Thanks for sharing these articles!